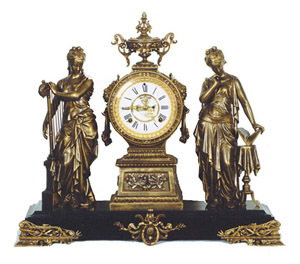 Ansonia Clock Co. figural clock, "Music & Poetry", ca 1894. Beautiful Japanese Bronze finish, enameled iron base, statues and ornaments identical to the catalog pictures. Recently restored by Bruce Baziluk. Movement is 8 day, strikes a gong on hours and half hours. Has a two piece porcelain dial, open escapement, a few hairlines that were cleaned in an ultrasonic machine and are now very difficult to see. This beautiful piece of art is 21 inches high and 20 inches wide. Correct pendulum, clock runs. Ly-Ansonia No.483.